Dennis and Lynda Blake were both raised in Christian homes. Lynda spent her childhood and youth actively involved in church activities. She invited Christ into her life at her parents’ bedside at age 8. Dennis chose a different path. He spent his youth seeking the things the world had to offer. At age 21, on Mother’s Day, Dennis gave his life back to the Lord. Dennis and Lynda met and fell in love at Moody Bible Institute in Chicago. At that time they both knew they wanted to serve the Lord in whatever path He chose for them. 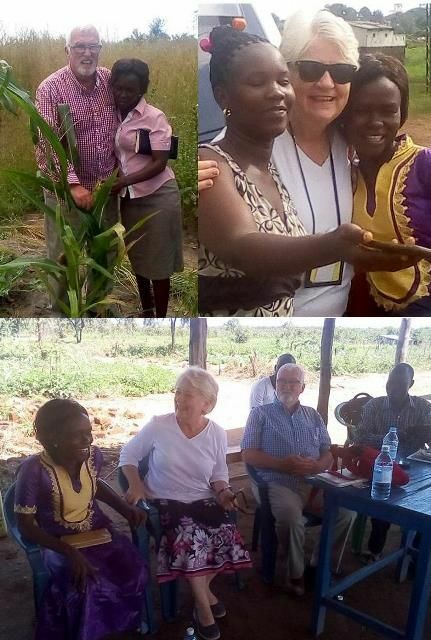 After retirement from education and public transportation, they became involved in some Christian schools in Africa. It was during these visits to Africa they became aware of the tremendous need for personal Bible studies among the children and adults. When they had returned from one of their trips, Dennis mentioned to his friend the fact that he was looking for Bible studies he could bring back to Africa. His friend, who attended a Community Bible Study (CBS) class, recommended Dennis contact the CBS Africa Regional Director and explore that avenue. The rest is history. Dennis and Lynda say, “We are now actively involved in a CBS class in our community and are the CBS Calebs to South Sudan, Africa. What an exciting and challenging opportunity the Lord has given us! We praise His name. He is doing a mighty work in Africa. Because of civil war in South Sudan, most of our friends no longer live in South Sudan, but are in the Rhino Refugee Camp located in Arua, Uganda. This is a camp where over 800,000 people now reside. Our work has now shifted to the camps. We bring Bibles and Bible studies and proclaimers (which are small, handheld solar energized devices that have the complete Bible recorded on them in their language) to the camp churches through Community Bible Study International. We train the church leaders to teach these studies to adults, children and youth. We help provide printed materials and physical needs to promote the work as it grows. Our goal is to travel to Uganda twice a year to teach, encourage and visit the Bible study classes. We work very closely with leaders in the churches and have national trainers who continue the work in our absence. This is their Bible study program and they have ownership. The people in the camps are so excited and grateful for the Bibles, materials and help! We serve a great God who is doing great things and we are so thrilled to be a part of His work!